TheBookDesigner.com welcomes our first guest author, Joanne Bolton. She brings to this subject many years of expertise in printing books overseas for American publishers. There are many things required on the copyright page of a book, and these are well documented, but what some self publishers don’t know is that they are required to say, in certain circumstances, where the book is printed. The rules are very specific for this. In fact, the only country that doesn’t need to appear on the copyright page is the United States of America. One can safely assume that if no country appears, then the book is printed in the USA. Customs wants the consumer to know if a book, and in most cases other tangible goods, are manufactured in another country. They feel the consumer has the right to know, and with that knowledge determine whether or not they want to buy that product. The rules, in the case of book manufacturing, are that the words “Made in Korea,” or “Printed in China” or something similar must be set in the same size type as the address of the publisher. Not the same size type as the publisher’s name, which might be in bold, and larger, but the address that usually appears underneath the name. This piece of information should also be close to the publisher’s address, so that the consumer is not misled into assuming the address of the publisher is also the manufacturing address. You might think if there’s no address given for the publisher that you are free to omit the country of manufacture. But that would be a terribly risky assumption. You may be able to reduce the font size a point or two without the address of your publishing company, but you should have your business information on the copyright page in any case. There’s no reason not to give your address and contact information, your web address, and so on, on the copyright page where 99.9% of interested people look to find that information. Customs inspectors have hopelessly thankless jobs. If they have to search around for some 6 pt type saying “Printed in Ecuador” along the gutter they are not going to be happy campers. Once riled, who knows what other infringements they might discover. One good thing is that if your printer has his office in Hong Kong you can say your book is printed in Hong Kong. How are you to know exactly where the printer prints your book? And Hong Kong is where most of the printers started out under British authority. And it is definitely not China, even today. If you don’t comply, your books are impounded, you are fined, and the books are not released until some sort of sticker is applied to them. It has never happened to me, but I have heard that when it does happen, you can forget the season in which you were hoping to launch your book, because it will be late. And that fact you were trying to minimize—that your book was printed overseas—will be prominently stickered and sticking out like a sore thumb. Joanne Bolton has been printing calendars and books overseas for more than twenty-five years, first in South Korea, then in Hong Kong and China. She began her career with Toppan Printing Company, a prestigious Japanese printer. Her years with Toppan gave her the knowledge to become an independent printing broker. Although at one point Joanne worked with very large calendar companies, she began to specialize in coffee-table books for independent publishers. She is a photographer herself and enjoys working directly with photographers and artists. Be sure to check her out at the Bolton Printing website. I self published in the past and I had the books printed in South Korea as it was incredibly cheaper. I created my own publishing house this year and I am about to release the first novel through my publishing house. But I still want to print in South Korea as I had a great relationship with that company and it saves money. I will have to list in the copyright section where it was printed. Will it be looked down on that I printed overseas and not in the US? Tammy, it’s not a problem and won’t be looked down on. Many publishers print overseas. Thanks for the great and useful article. Are you allowed to use “Published in [country]”? The book consists of a few short stories written and illustrated by people from all over the world. The publisher is located in a single country. The book is available via print on demand in various countries. There is more than one printer, each in a separate country (i.e. book is submitted to more than one print on demand printer). Therefore “Made in [country]” or “Printed in [country]” may not apply in this specific case. If “Published in [country]” is not the best to use, what would be? I have developed a Christian teaching book on Transformation which is quite useful for individual as well as for a group. I just don’t have any idea about the printing and the copyright or any act. Hence, I would like to seek your valuable suggestion in regard to it. The purpose is not a marketing or a sale. It is entirely a free distribution to Churches and Leaders to see an overall outcome of deliverance. Can you suggest me an idea on how to make it in a book form, the publishing and the points to be aware about. I thank you for any information given to me. Your cooperation is highly appreciated. Please use my mail Id for any reply. this is a fantastic idea, but fantastic ideas have their own problems. It’s easy to speak your heart and say it’s for free, but to implement it is not so easy due to cost factors. You have to have a lot of money to publish and give it out for free. Even if you don’t want to make any profit, you have to ask money to cover your costs, otherwise you have to find a sponsor to cover all your copyright, printing and sending costs. The easiest and cheapest way these days, is to do e-marketing where people can download for free and read your book. You still have to register copyright, otherwise other people can take your work, register it on their name, publish and make money from your book. It’s not nice to see a book published by someone else, and find it’s your book. I hope this can give you a little help. I have written a children’s picture book which I am having printed in China. (I am a U.S. citizen currently living in China, where my husband is teaching in an international school). I am planning on shipping the books to the U.S. where I have a friend who has agreed to be my distributor. I am wondering what to put for “publisher” on the copyright page. Can I just put my own name? Or, can I make up any publishing name I please? I have not registered a company. Also, do I need to put my Hong Kong Address (I have a P.O. Box there). I do have a U.S. residence where my sister manages all of my mail and forwards on important mail to me. Or, should I put the address of my distributor? Thank you for any information you can give me on these two questions. I’m a foreigner working and living in China. Over the past 9 years, I’ve developed and taught 6 courses at university with great success. Students’ feedback during their courses as well as years after in the job market, motivated me to put it into book form. I completed 5 books in both Eng and Chinese on oposite page and readers friendly. These are step to step guides and ready to use templates with PPTs ready to use in class or companies. A book each for 1st, 2nd, 3rd and 4th year and a combination off all for the professionals in the job market. The books are targeted for university students and professionals in both China and India. I don’t want to let all my profits go to a publisher. I’ve worked too hard for that. Can you give me advice please. Thank you. The books you’ve developed sound quite useful. The problem with publishing for the education market is negotiating the rules and procedures of the authorities who buy books for use in schools. If you book is targeted more for individuals, you shouldn’t have any problem. And even if you are targeting institutions, you can probably find quite a bit of help on how to do so from other self-publishers who have done it before. 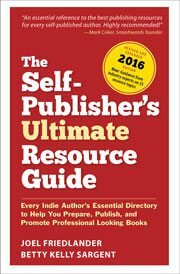 You might try starting out with querying people on the publishing lists I mentioned in the article Three Indie Publishing Discussion Groups. Good luck. Joanne, thanks for this informative article. It’s a pleasure to have you as a guest on theBookDesigner.com. Please let us know if you have other topics of interest to our readers.